Most babies are born with soft, flawless skin, but some babies develop a baby acne or rash on their chest between their 2nd and 4th weeks of life. This rash may appear as small yellow, red and/or white pimples, blotches and/or blisters. The exact cause of baby acne on chest is undetermined at this time, but hormones appear to play a significant role in its development and progression. According to Neustaedter (2010), a hormonal imbalance can cause the body to produce excess amounts of skin oil, which can clog the baby’s pores and lead to baby acne on the chest. Baby acne on the chest can occur at birth or it can arise approximately 3 to 4 weeks following delivery. A baby with chest acne will present with small pimples on his/her chest. It is important to note that baby acne can also occur on the cheeks, eyelids, forehead, neck and/or chin. 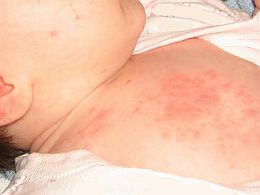 A baby with chest acne may also experience an elevated body temperature and appear fussy and/or irritable. Although rare, a baby may develop blackheads and/or pimples that resemble a mild case of teenage acne during his/her first year of life. Baby acne typically occurs in babies that have a strong family history of acne and/or skin disorders. Baby acne on the chest may be difficult to accurately diagnose, because the condition resembles a variety of skin disorders, infections and diseases. In fact, baby acne may be mistaken for a simple skin irritation or a serious allergic reaction. This condition typically occurs when the baby’s sebaceous oil glands become blocked. Once the baby’s oil glands are clogged, he/she develops pimples, whiteheads and blackheads on his/her chest. According to Casey (2013), approximately 20% of babies experience acne-like rashes during their first year of life. This condition is not critical and typically diminishes after the baby’s first birthday. There is currently a debate amongst pediatricians as to whether or not baby acne is truly a form of acne or if it is just another type of skin rash that happens to occur in babies. Some believe that baby acne is true acne because it resembles acne commonly found on adolescents, teens and adults, while others believe that the baby acne is a type of skin irritation that is not related to acne commonly found on older children and young adults. The jury is still out on the exact nature of acne-like rashes in babies, but the majority of pediatricians agree that hormones appear to contribute to this condition. Once baby acne on the chest is accurately diagnosed, it is normally treated with antibiotic creams or gels, oral antibiotics, benzoyl peroxide creams or gels and/or small dosage of tretinoin, an acne medication that clogs pores and aids in the healing process. Baby acne should be treated as soon as possible to minimize scarring and/or permanent skin damage. Treatment may also consist of washing the baby’s chest with sensitive baby soap several times a day. The water should be warm and soapy. Gentry wash the baby’s chest with a soft soapy sponge for 1 to 2 minutes. Rinse the affected area (the baby’s chest) for approximately 25 seconds. Gently pat the baby’s chest dry with a soft, white cotton towel. Rinse the baby’s chest for another 25 seconds. Once again gently pat the baby’s chest with a soft white cotton towel. Apply prescribed creams or gels to the affected area. Repeat this process at least 3 times a day. Casey, M. (2013). Baby acne care [Kindle DX version].